Scenery Order in X-Plane determines which scenery is visible and how the various sceneries you have installed are layered. It's very important to get the order correct, as having incorrectly ordered scenery can cause strange problems, such as trees on a runway, or a completely blocked scenery. An overlay scenery is a scenery designed to be "overlayed" on top of another scenery or mesh. Overlay sceneries are always placed on top of base/mesh sceneries. 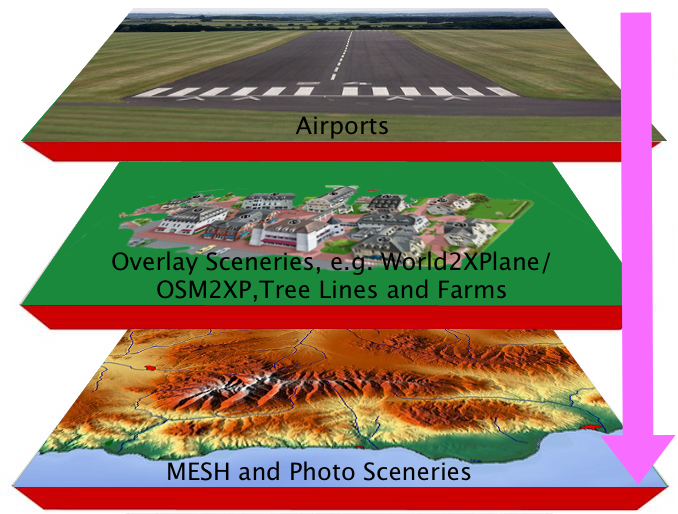 Examples of overlay sceneries are World2XPlane sceneries, Simheaven scenery containing landmarks, a scenery containing roads, etc.. Airport sceneries are also overlays, i.e. They are placed on top of other sceneries, however as we will see, it's important that airport sceneries are placed above other overlay sceneries because of something called an exclusion. An exclusion is a rectangular area which tells X-Plane to block a specific type of scenery below it. This is important, because without exclusions, one overlay scenery's objects could conflict with another. The global scenery and HD Mesh, for example, include autogen, and if an overlay scenery provides its own houses (such as World2XPlane), then it will have to exclude the autogen from the base mesh below. If you place an airport below an overlay scenery which has exclusions, the exclusion might block out the airport. World2XPlane scenery, and OSM scenery from Simheaven have smart exclusions which is a feature that only creates exclusions where there is scenery. e.g. If you have a village where half of it has data/buildings in OpenStreetMap, and the other half is empty, an exclusion will only be created around the part of the village that has the buildings. This way, the default scenery and autogen will show through in otherwise empty areas. To complicate matters slightly, there are several types of exclusions. A scenery can be told just to block forests, or roads, or houses, etc. World2XPlane sceneries include their own roads, and as such always include an exclusion to block all roads from the scenery below. Without such an exclusion, the roads would be drawn twice and look a mess. As long as you follow the simple rules (to follow), then you shouldn't have any issues with the sceneries. An airport should include exclusions to prevent objects, trees and roads appearing on the airport grounds (or runway). Whilst some airport developers do correctly create exclusion zones, others don't, and airports without exclusion zones are the main cause of seeing trees or objects on an airport ground. It should be the responsibility of the airport developer to create the exclusions, however not everyone does. If you find such an airport, I'd suggest contacting the author to get this fixed. 1) Mesh and Photo Sceneries should ALWAYS be below any other scenery. A mesh scenery will block out anything below it, so should be at the bottom of the list. 2) Overlay sceneries, e.g. OSM, city sceneries, landmarks etc should always be placed above mesh sceneries. Also, if an overlay scenery has an exclusion, then it should be placed above the scenery the exclusion is intended to block. e.g. If you have a city scenery for Berlin which has an exclusion zone for the city, it should be placed on top of a scenery you may have for all of Germany. Overlay sceneries are generally ordered from most specific to least specific. 3) At the top of the list should be airports. Airports should block out any overlay sceneries below. If you place an airport below an overlay scenery, it may end up being blocked out or behave unexpectedly, e.g. by having trees on the runway. For airports without exclusion zones, you may still get objects and trees on a runway. How do I order my scenery? By default, X-Plane orders scenery alphabetically. This is why you often see mesh sceneries beginning with a "z" so that they will appear on the bottom, whereas airports are often prefixed with "Airport", e.g. "Airport - EDDB", so that they appear above other sceneries. However, not every developer follows these rules, and there can be conflicts. Also, once X-Plane has created the scenery order file "scenery_packs.ini", any new sceneries you add will be placed on the top of the list regardless of their name. Sometimes it's possible to resolve scenery order conflicts by simply deleting the "scenery_packs.ini" file, and letting X-Plane regenerate it (However, this only works if all scenery you have follows the alphabetical naming rules). All scenery you have installed inside Custom Scenery is listed in a file called scenery_packs.ini, also placed inside Custom Scenery. This file is a simple text file which contains a list of all your scenery in priority order, i.e. Entries at the top of the file will have priority over items at the bottom. In the above example, all airports are placed at the top, followed by the overlay sceneries for Austria and Germany. At the bottom of the list are the photo and mesh sceneries for Innsbruck and Berlin (which include HD Mesh as part of them). The libraries can be placed anywhere you want, as these aren't sceneries. To change scenery order, open up the file Custom Scenery/scenery_packs.ini in your X-Plane folder using a program such as notepad, and simply swap the lines around. Whenever you install a new scenery, open up this file and place the new scenery into the correct place. e.g. If I add a photo/mesh scenery called z+52+012_D, I'd place "SCENERY_PACK Custom Scenery/z+52+012_D" at the bottom of my file. IMPORTANT! : Whenever you drop a new scenery into your custom scenery folder and start X-Plane it will add an entry automatically into this file. Always make sure it has added it correctly and doesn't block out other scenery by using the rules listed above. Thanks, I hope people will find it useful, it's an extremely common cause of scenery issues in X-Plane. I took a look at my ini. It is badly out of order. Now, I am not a scenery guy .. so the last four still has me wondering. "The last four lines depends on whether you have newer versions or custom versions, but generally it should be above and photoscenery or HD Mesh, and below any OSM scenery"
I have absolutely no idea what any of this means. "but generally it should be above and photoscenery or HD Mesh, and below any OSM scenery"
I would not know if anything in my ini list is this stuff or not. HD Mesh and OSM ..... I do not know what they are. That is why I posted the contents of my INI list. i was hoping someone could tell me how to correct the order .. because I had some items in my list that are not in the first post of this topic. , but if you did, it would go at the bottom of the list. My scenery ini is ok as is .......... Thanks. I don't have Andras's HD Mesh v3 so I will check it out and put it at the bottom of my ini if I get it............ Thanks. I am not sure what OSM stands for, is this OK? Select the line you want to move i.e select all the text. This is easily found using google by the way. Save you time waiting for an answer here. This is very useful, thanks ! My question is, how to look at a file and determine whether it is an airport, OSM, Mesh, Photoscenery, or come combination of these. What sets these types of files apart ? I found this article very useful but I have a question about scenery conflicts and how to address them. For example, I have recently downloaded a whole slew of add-ons for XP, seeing as though I am new to XP and love it so far. One scenery in particular was EGKK (at the recommendation of another XP user) and after installing it, I found conflicts, not realizing that XP comes with a default EGKK, made by Aerosoft. I'd like to trade one for the other, but am wondering if it is as simple as removing the scenery folder from the custom scenery directory, allowing XP a reload and Bob's your uncle, OR is there something else I would need to do? Make the global airports entry in the scenery_packs.ini the last for airports. That way custom airport will always supersede the default stuff. So even though there is an entry for Aerosoft's EGKK, I should move the global airports entry towards the bottom? I had thought that if there was a separate folder for each airport, they would have their own entry that was managed by XP...I guess I was wrong, thanks. Oh! I forgot about aeorsoft, yes move that to the bottom or at least below the new EGKK entry. Still a good idea to keep the global airports at the bottom. Great job, Tony. I was all excited when I saw this, copied it, and THEN....discovered it was for X-Plane. I'm on P3D. ARGGGHHHH! Oh, well. 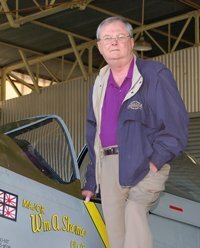 Are al these Advices simular for XP 11 Beta ?